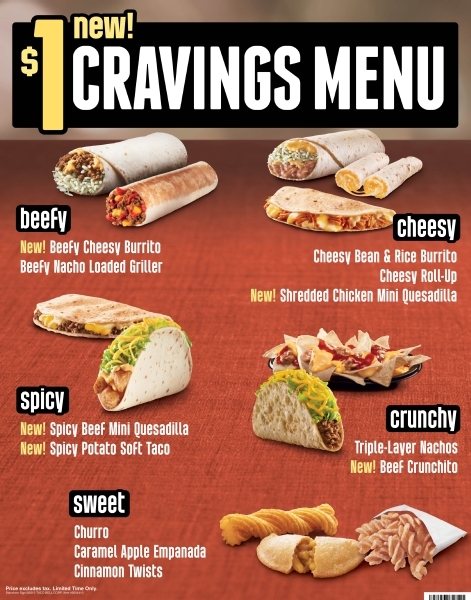 It looks like Taco Bell's $1 Cravings Menu is increasingly likely to replace the "Why Pay More Menu" as their value menu. Everything on the test menu is $1 rather than the .79-, .89-, and .99-cent price points of the "Why Pay More" menu. The Cravings menu has been revised and updated quite a bit since I last wrote about it last year. While the "Beefy," "Cheesy," "Spicy," "Sweet," and "Crunchy" categories still apply, the menu items that fall under each have changed quite a bit. - New Beefy Cheesy Burrito - a burrito filled with seasoned ground beef, Latin rice, and nacho cheese. - New Cheesy Bean & Rice Burrito - A holdover from the previous iteration, it feature nacho cheese, Latin rice, and refried beans in a flour tortilla. - New Shredded Chicken Mini Quesadilla - a mini-quesadilla with marinated, shredded chicken and 3-cheese blend. - New Spicy Beef Mini Quesadilla - a mini-quesadilla with ground beef, 3-cheese blend, and spicy chipotle sauce. - New Spicy Potato Soft Taco - it's a Crispy Potato Soft Taco, but with the addition of spicy chipotle sauce. - New Beef Crunchito - like a Crunchy Taco (lettuce, cheese, seasoned ground beef), but in a fried flour tortilla rather than corn. One of my local Taco Bell restaurants is offering the test menu, so I'll have some reviews up soon. 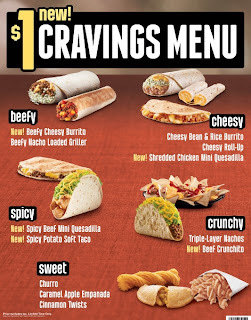 Besides select locations in southern California, the $1 Cravings menu is in market test in Sacramento and Kansas City. is there any update on this? I cannot find anything on whether this is going into effect, and if it is, when? It's still in test as far as I know. Taco Bell does a lot of tests so it's hard to say which will ever go to market. Visited KC earlier this year and having a Cheesy bean was basically a religious experience.